Hidden New Jersey: Oh, the humanity! Wandering around Lakehurst. First it was the railroad hub for the Pinelands. Then it became a popular resort. Then it was the site of the nation's first international airport and the place where the growth of the passenger airship industry came to a fiery halt. And now its population has soared, thanks to the host of retirement communities built there over the past 30 years. Yup, I'm talking about Lakehurst, Ocean County. On one of our rare non-bird-related jaunts, Ivan and I made our way down the Parkway to Route 70, drawn by the lure of another type of flying object. We hadn't registered in advance for a tour at the Naval Air Engineering Station, but I was confident we'd uncover something worthwhile. Any small town that gained international notoriety for a disaster had to have plenty of interesting stuff. Plus, it's in the Pinelands, where the unusual is commonplace for explorers. Leaving the highway and heading to the compact downtown, we saw that the locals take pride in their connection to the history of the airship. 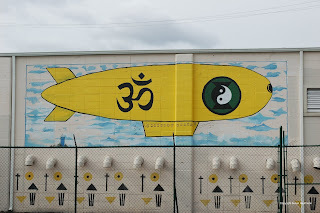 Whether you call them blimps or dirigibles or something else, they're represented in a lot of signage and outdoor artwork around town. Awnings on borough hall proclaim Lakehurst to be the Airship Capital of the World (take that, Friedrichshafen! 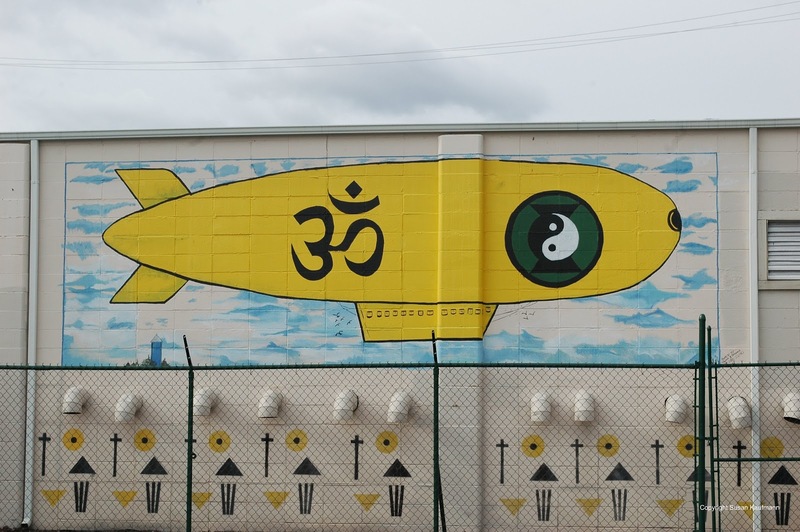 ), and even the local laundromat sports a large painting of a Buddhist-themed airship. Om, the humanity? That's the south side of the highway. The Naval Air Engineering Station is down a road to the north, obscured by the region's signature pines. Signs warn passers-by about security measures and low-flying aircraft, reminding us that even though it's a historic landmark, the airfield is still an active military base. It's difficult to get a clean photo of the massive airship hangar from the road or a nearby housing development, though the building towers above the scrub pines in the foreground. Disappointing, yes, but we had other destinations to check out. First, however, it was time for lunch. Regular readers know that I'm a diner burger aficionado, and it was time to see where the local contender stood in the pantheon. We'd passed the Lakehurst Diner on the way in, and we had to know: do they have a Hindenburger Deluxe on the menu? Sadly, management had seemingly overlooked this golden opportunity for a local special (well-done cheeseburger with sauerkraut, anyone? ), though they offered a "Blimp" steak sandwich. I guess you have to take what you can get. Following a tasty cheeseburger meal, we returned to the other side of the highway for the highlight of our visit, the Lakehurst Historical Society in tiny Old St. John's Church. It's the only town museum I know that's surrounded by a graveyard, having served as the community's Catholic sanctuary until the congregation outgrew it. Starting in the 1980s, an influx of retirees from Northern New Jersey started coming to the worship regularly, forcing the parish to move first to a community center and then to a newly-constructed church not far away. Outside, the museum/church is a tidy, picturesque white wooden chapel. Inside, it's an interesting panoply of historic artifacts, juxtaposed with classic Catholic symbols. The Stations of the Cross are still on the walls, hanging above old railroad tools and World War II-era ration stamp books, and there's a painting of Jesus looking over a collection of vintage clothing. The community's first jail cell stands in a corner not far from the entrance to the sanctuary. That would make a novel confessional, don't you think? We expected to see a few Hindenberg artifacts and maybe something or other on the Jersey Devil, but it turns out that Lakehurst has other notable yet lesser-known claims to distinction. An entire display case is dedicated to the Pine Tree Inn, an expansive Victorian resort that operated from 1898 to 1937. Well-to-do visitors from New York and Philadelphia flocked there from 1898 to 1937 to escape the city and enjoy the quiet beauty of the Pinelands. For much of the hotel's last decade of operation, many of its guests probably got to Lakehurst via the Blue Comet, the Jersey Central Railroad's answer to the Twentieth Century Limited (more on that in an upcoming post). The Historical Society has plenty of information and objects to tell the story of both, and more! From the earliest days of the area's bog iron and charcoal industries that supplied the Continental Army during the Revolutionary War, to present day, if you're curious about something in Lakehurst, somebody at the Historical Society can probably tell you about it. Just be sure to stop by on Wednesday or Sunday afternoons, when they're open.